Celium technology plays critical role in Hawke’s Bay Cape to City environmental restoration project. 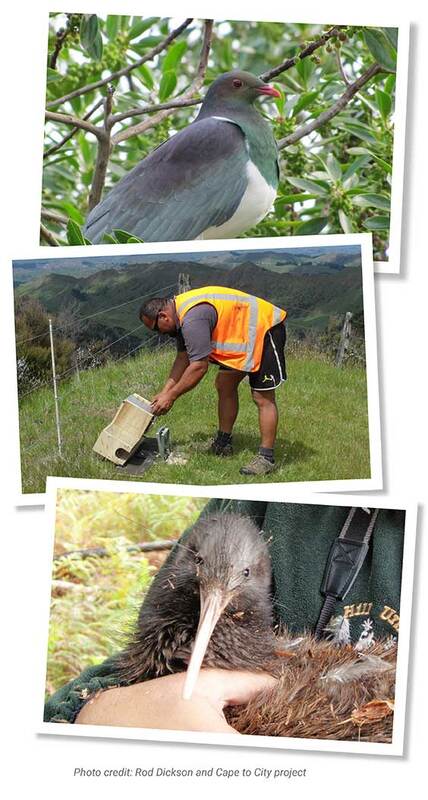 The Cape to City project, a world-leading initiative to help New Zealand native species thrive, is using Encounter Solutions’ Celium technology as a key part of their wide scale predator control strategy. Covering an area of 26,000 hectares of farmland that lies between Hastings and Cape Kidnappers, the project is a collaborative partnership between the Hawke’s Bay Regional Council, the Department of Conservation, Landcare Research, Cape Sanctuary and Aotearoa Foundation as well as private business and other Crown Research Institutes. With over 200 pieces of very low power specialist radio and sensor equipment already being trialled throughout Hawke’s Bay region, Celium wireless sensor network is opening up far more efficient and cost effective ways of monitoring traps laid within the landscape. From a large scale pest control perspective this technology is game changing. It identifies where and when networks need to be visited, meaning that maintenance visits can be targeted and driven by actual need rather than by routine. Government agencies, pest control operators, landowners, conservation groups and volunteers will be able to make better use of their time by focusing their visits on the parts of their networks that need it most. More volunteers are likely to get involved and engaged in biodiversity efforts because they will be able to participate for shorter periods of time and the hours they do give will have more impact. Feral cats carrying the disease toxoplasmosis are also the target of the predator programme and could save farmers in excess of NZD$4.5 million dollars a year. Thirty percent of sheep carry the disease, which causes a high abortion rate in pregnant ewes. By reducing feral cats, it is hoped abortion rates will decrease and farmers will enjoy increased production along with the biodiversity gains created through the Cape to City project. Copyright © 2017 Encounter Solutions Ltd.